[Editor's note. The following letter (and bibliography) was forwarded to Substance from a number of lists by one of our friends, California teacher Claudia Ayers. It has already generated a good deal of response, and we are reprinting it here for our readers who have not yet seen it. The letter is shared here with Substance readers with permission of Ms. Ayers]. Do you want to be re-elected? Do you not know that TEACHERS are the largest, most effective, and most essential component of your base? All things considered, teachers are doing astonishingly well. You would never know it based on the images presented by your Secretary of Education, by you, and by the press. Until you understand the concept of bi-serial correlation and the relative insignificance of standardized test scores, you will continue to under-serve public schools. Again: there are virtually no intelligent teachers who support Arne Duncan, and merely replacing him with a solid educator will give you an enormous bump in your approval ratings. One of every hundred people in the US is an active teacher, each with an average number of daily contacts of around 40 other voters (including parents, grand-parents, and all students over the age of 18). Teachers will be with you if they think you know anything about education. You send your kids to a private school for God’s sake. Trust me, when you discuss the needs of public school children, you are not credible. Yet. Arne Duncan has receive complete support from President Obama during his attack on public education and the vicious expansion of privatization since the inauguration in January 2009.I myself attended Woodrow Wilson High School in the District of Columbia; Frank Rich was a classmate, and remains a treasured friend. I’ve been a teacher in inner city and suburban California public schools for 22 years. 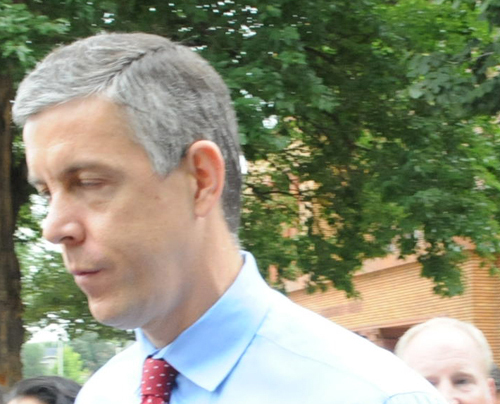 I have done extensive research, and have a good sense of what works in classrooms: I know without a doubt that Arne Duncan is a severe liability for you. He is profoundly out of touch with authentic teachers and terribly ill-informed. To quickly improve your education policy perspective, PLEASE invite Deborah Meier, Alfie Kohn, Susan Ohanian, Stephen Krashen, Diane Ravitch, and Monte Neill to an informal, confidential meeting. In just a few hours they could deepen your understanding of education, tell what is at stake, and help you to better proceed with a much improved national education policy. They have proven experience and dedication. Their collective understanding of education research reaches profound depths. The attached will tell you more about them. Deborah W. Meier is currently at New York University’s Steinhardt School of Education, as senior scholar a as well as Board member and director of New Ventures at Mission Hill, director and advisor to Forum for Democracy and Education, and on the Board of The Coalition of Essential Schools. Meier has spent more than four decades working in public education as a teacher, writer and public advocate. From 1997 to 2005 she was the founder and principal of the Mission Hill School a K-8 Boston Public Pilot school serving 180 children in the Roxbury community. The schools she has helped create serve predominantly low-income African-American and Latino students, and include a typical range of students in terms of academic skills, special needs, etc. There are no entrance requirements. These schools are considered exemplars of reform nationally and affiliates of the national Coalition of Essential Schools founded by Dr. Ted Sizer. A learning theorist, she encourages new approaches that enhance democracy and equity in public education. Meier is on the editorial board of Dissent magazine, The Nation and the Harvard Education Letter. She is a Board member of the Association of Union Democracy, Educators for Social Responsibility, the Panasonic Foundation, and a founding member of the National Board of Professional Teaching Standards, the North Dakota Study Group on Evaluation and the Forum for Democracy and Education, among others. Meier was born April 6, 1931 in New York City; she attended Antioch College (1949-51) and received an MA in History from the University of Chicago (1955). She has received honorary degrees from Bank Street College of Education, Brown, Bard, Clark, Teachers College of Columbia University, Dartmouth, Harvard, Hebrew Union College, Hofstra, The New School, Lesley College, SUNY Albany, UMASS Lowell, and Yale. She was a recipient of the prestigious MacArthur Fellowship in 1987. Her books, The Power of Their Ideas, Lessons to America from a Small School in Harlem (1995), Will Standards Save Public Education (2000), In Schools We Trust (2002), Keeping School, with Ted and Nancy Sizer (2004) and Many Children Left Behind (2004) are all published by Beacon Press, as well as her latest, Playing for Keeps, with Breda Engel and Beth Taylor publiched by Teachers College Press. WHAT DOES IT MEAN TO BE WELL EDUCATED? And More Essays on Standards, Grading, and Other Follies (Beacon Press, 2004) A collection of articles that were originally published between 1999 and 2003, dealing with topics ranging from the purposes of schooling to the SAT to the implications of Sept. 11. THE CASE AGAINST STANDARDIZED TESTING: Raising the Scores, Ruining the Schools (Heinemann, 2000) A short, accessible, Q & A-style book on tests and what we can do about them, expanding on information in the Schools book described below. THE SCHOOLS OUR CHILDREN DESERVE: Moving Beyond Traditional Classrooms and "Tougher Standards (Houghton Mifflin, 1999) Challenges widespread assumptions about back-to-basics and "bunch o' facts" teaching, as well as the current test-driven accountability movement. (Jossey-Bass, 1998) A collection of articles that were originally published between 1989 and 1998, dealing with topics ranging from character education to caring classrooms to the effects of watching TV. PUNISHED BY REWARDS: The Trouble with Gold Stars, Incentive Plans, A's, Praise, and Other Bribes (Houghton Mifflin, 1993/1999) Makes the case against using rewards with students, children, and employees; lengthy chapters offer alternatives to traditional carrot-and-stick practices at school, at home, and at work. (Basic Books, 1990) Draws from hundreds of studies to argue that selfishness and aggression are no more "natural" than caring and generosity. Argues that competition is counterproductive in all areas of human life - work, school, play, and family - undermining achievement, damaging self-esteem, and poisoning relationships. A collection of essays by various authors critical of corporate involvement in schools, including such topics as advertising to children and efforts to privatize education. (Beacon Press, 2011) A collection of articles that were originally published between 2004 and 2010, dealing with topics ranging from cheating to national standards to Supernanny. to Love and Reason (Atria Books, 2005) Begins with the question “What do children need – and how can we meet those needs?” rather than “How can we get kids to do whatever we tell them?” Helps parents to move from techniques that emphasize control (and conditional acceptance) to an approach designed to help kids grow into good people. WHY IS CORPORATE AMERICA BASHING OUR PUBLIC SCHOOLS? (Heinemann, 2004) Because it's in their interests-not yours. Where exactly did high-stakes testing come from anyway? Neither parents, teachers, administrators, nor school boards demanded it, and now many communities feel powerless to reverse its appalling effect on our schools. CAUGHT IN THE MIDDLE: Nonstandard Kids and a Killing Curriculum (Heinemann, 2001)A follow-up to One Size Fits Few, this book cuts to the heart of classroom dilemmas. Heart-wrenching and heroic portraits of students show what teachers and students do when standards are shipped in from State Ed. Here's what Deborah Meier says in the Foreword: "To me, Susan is the quintessential teacher. . . Thanks Susan--on days when the going is toughest, you and your students will always be there with me to help me remain sane. And hopeful." A scathing indictment of standardized testing, delivered with sharp wit (reserved for the proponents of testing), and love and empathy (for the students whose lives and learning is profoundly affected by it). Ohanian crafts a powerful argument against the use of standards. Diane Ravitch is, according to Wikipedia, “an historian of education, an educational policy analyst, and a research professor at New York University's Steinhardt School of Culture, Education, and Human Development. Previously, she was a U.S. Assistant Secretary of Education. …Ravitch said that the charter school and testing reform movement was started by ‘right wing think tanks like the Heritage Foundation,’ for the purpose of destroying public education and teachers' unions. She reviewed the documentary Waiting for Superman, directed by Davis Guggenheim, as ‘propagandistic’ (pro-charter schools and anti-public schools), studded with "myths" and at least one ‘flatly wrong’ claim. Of Education Secretary Arne Duncan's Race to the Top program, Ravitch said in a 2011 interview it ‘is an extension of No Child Left Behind ...[,] all bad ideas.’ She concluded ‘We are destroying our education system, blowing it up by these stupid policies. And handing the schools in low-income neighborhoods over to private entrepreneurs does not, in itself, improve them. There's plenty of evidence by now that the kids in those schools do no better, and it's simply a way of avoiding their - the public responsibility to provide good education.’" She received a Ph.D. in the history of American education in 1975. He earned a Doctorate at Harvard University with his dissertation The Struggle of Boston's Black Community for Quality and Equality in Education: 1960-1985. He has taught and been an administrator in pre-school, high school and college, and he is a grandfather of three children in the public schools. Monty can be contacted at (617) 477-9792 or at monty@fairtest.org. I’m sure he would be willing to find a date when all these activist educators could be available to meet with you.